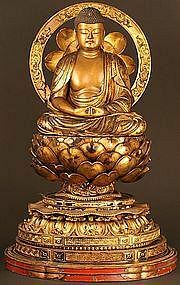 Museum Quality Early 18th Century Edo Period (circa 1700) Gilded Japanese Sculpture of Amida Nyorai Buddha. Seated cross-legged in the lotus posture, hands joined in the mudra of contemplation, eyes all but closed in meditation, we are gazing upon the sculptor's vision of Amida enthroned in paradise. The elaborately carved lotus upon which he sits is itself a symbol of the attributes of the Amida Buddha: gentleness, openness, and purity. This is a large, rare and exquisite example, fabulously carved in every aspect, from the nimbus, the lotus, and the multiple stands, to the Buddha himself, all sumptuously lacquered in beautiful gold. The Buddha's hair is arranged in snail-like curls, and a sacred jewel adorns his forehead. The robes are enhanced with gorgeous black lacquered designs. 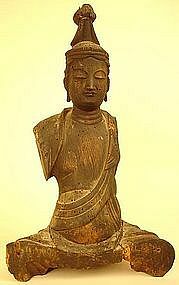 This Buddha is imbued with all of the gentle idealism one associates with Japanese Buddhist sculpture. We are proud to offer this masterwork. 32.5 inches (82.5cm) tall x 21 inches (53.5cm) wide. From a widely renowned and published collection that has been exhibited at the Metropolitan Museum and Japan Society. 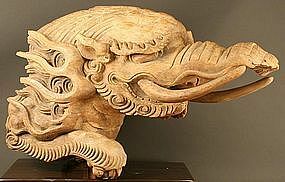 17th Century Early Edo Period Spectacular Japanese Temple Sculpture of Baku, a mythical beast loosely representing an Elephant with a combination of other animals, creating an original form. The Baku is the "Dream Catcher" of ancient Japanese Shinto mythology. It is inserted in the ceiling to watch over the temple. This Baku is a masterpiece sculpture of magnificent presence. It will surely be the focal point in any environment. It is carved entirely from solid Keyaki (Zelkova) wood, one the finest woods of Japan, and it takes two men just to lift it. Mounted on a lacquered stand, it rotates easily on the stand. 36 inches (91.5 cm) long x 25 inches (63.5 cm) tall. From a widely renowned and published collection that has been exhibited at the Metropolitan Museum and Japan Society. 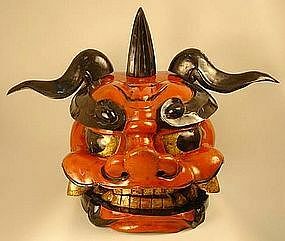 Spectacular Early Meiji Period (circa 1880) Japanese Lion Mask used on the head of a float for the Gion Festival. This huge mask is an arresting image to behold. This fabulous carving is heavily lacquered in red, black and gold. The head can be raised to show his open mouth, creating a very impressive and imposing presence to behold. 38 inches (96.5 cm)w x 25 inches (63.5 cm)h x 24 inches (61 cm)d. From a widely renowned and published collection that has been exhibited at the Metropolitan Museum and Japan Society. 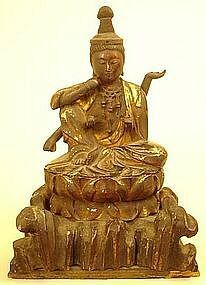 Rare Japanese Heian Period, 12th Century Wood Sculpture of Kannon, the Goddess of Compassion and Mercy. Even though it is not in a complete state, it has a wonderful, peaceful presence that is really a delight to bask in. It has a magnetic face with a serene expression. Japanese sculpture of this age is hard to find. A fabulous work of art and a rare, magnificent sculpture. 16 inches, 40.5 cm. From a widely renowned and published collection that has been exhibited at the Metropolitan Museum and Japan Society. 16th Century Japanese Momoyama Period Wood Sculpture of Nyoirin Kannon, widely worshiped by those who hoped to gain riches and fulfill requests, seated on a lotus flower on rocks. Nyoirin's pose was appealing to devotees: his relaxed pose is inviting and the hand raised against his leaning head, which signifies a meditative state, adds a human touch. The bodhisattva's pose, in fact, indicates that he is resting in his personal paradise on Mt. Potalaka, which traditionally is said to be located in the sea south of India. This remarkable sculpture is exceptional for its age and beauty, and is adorned with a necklace of jewels and has a beautiful patina, retaining much of its gold lacquer. 7.5 inches (19 cm) tall, 5 inches (13 cm) wide, 3.75 inches (9.5 cm) deep. From a widely renowned and published collection that has been exhibited at the Metropolitan Museum and Japan Society. 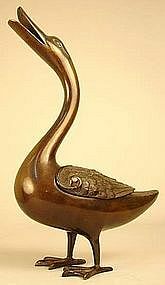 Late Edo Period (1850 - 1868) Bronze Incense Burner Sculpture of a Duck, Japanese symbol of faithfulness and light. An exquisite expression of Japanese bronze craftsmanship of the finest quality. It exhibits a rich dark patina. 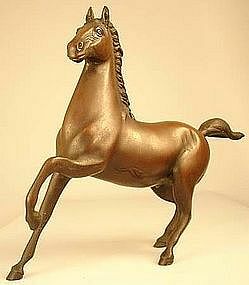 A Japanese bronze classic. An important acquisition for a bronze collector. 13.75 inches, (35cm) tall. From a widely renowned and published collection that has been exhibited at the Metropolitan Museum and Japan Society. 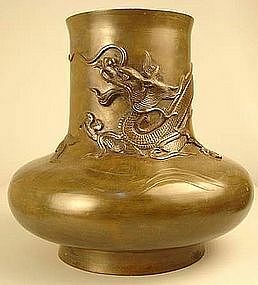 Late Edo Period (1850 -1868) Kyoto Bronze Vessel with an Encircling Dragon beautifully casted in high relief. Rich patina, wonderful shape, and a stunning design. Dragons are a Japanese symbol of strength and valor. 10 inches (25.5cm) tall x 10 inches (25.5cm) across. From a widely renowned and published collection that has been exhibited at the Metropolitan Museum and Japan Society. Large Japanese Early Meiji Period (circa 1880) Okimono of a Kirin, one of the most magnificent and admired creatures in Japanese mythology. The Kirin is a Japanese unicorn, an animal-god who punishes the wicked with its single horn. It protects the just and grants them good luck. 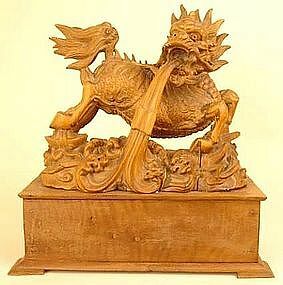 Seeing a kirin is considered an omen of extreme good luck - if one is a virtuous person. This spectacular carving is a masterpiece. It truly captures this fantastical creature in every detail. 13.25 inches (33.5cm) tall x 12.75 inches ( 32.5cm) wide x 7.25 inches (18.5cm) deep. From a widely renowned and published collection that has been exhibited at the Metropolitan Museum and Japan Society. 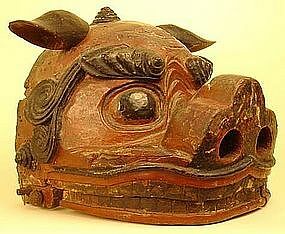 Very Rare Early Edo Period (early 17th Century) Japanese Lion Mask for the Gion Festival. It would have been part of a two man costume, one man holding the mask and the other at the back covered by fabric to perform the traditional Lion Dance. 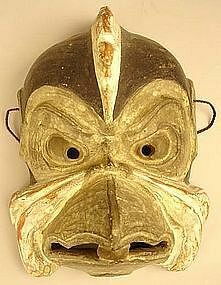 To find this mask from such an early period is really quite an important find for the serious mingei collector. 12 inches (30.5 cm)h x 10.5 inches (27 cm)w x 11 inches (28 cm)d. From a widely renowned and published collection that has been exhibited at the Metropolitan Museum and Japan Society. Late Meiji Period (circa 1900) Japanese Signed Okimono Sculpture of a pair of Mandarin Ducks, symbols of life long faithfulness and one of Japan's most beautiful birds. Original artist signed box is included. Beautifully carved of Poloma wood, one of the finest woods used in Japanese sculpture, and gorgeously painted with vivid colors. They can be exhibited in an endless variety of positions and make a wonderful object of art. 3.5 x 8 inches, 9 x 20 cm. From a widely renowned and published collection that has been exhibited at the Metropolitan Museum and Japan Society. 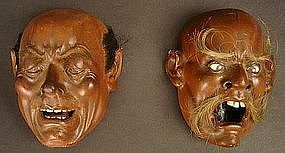 Pair of 19th Century Japanese lacquer miniature composition masks representing living ("Iki" living figures) expressive faces, with ivory teeth, glass eyes and human hair. They have an arresting presence and are a great study of portraiture, representing fine Japanese craftsmanship. 5 inches (12.5cm) x 4.25 inches (11cm) wide (each). From a widely renowned and published collection that has been exhibited at the Metropolitan Museum and Japan Society. 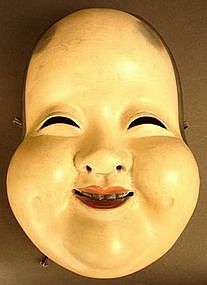 Late Edo Period (1850 - 1868) Japanese signed Noh theater Mask of Okame, the Goddess of Mirth, a very popular image in Japanese culture. A beautiful example of the type of mask done by a master carver, using Cypress wood (Hinoki) and many layers of Gofun, crushed oyster shell lacquer. A very charming and well rendered image. From a widely renowned and published collection that has been exhibited at the Metropolitan Museum and Japan Society. 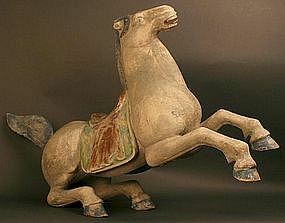 Japanese Antique Bronze Horse in a classic galloping pose. A solid, strong image with rich patina, finely rendered detail, naturally executed. A fine addition for horse fanciers. Signed, circa 1920. 12 inches (30.5cm) tall x 15.75 inches (40cm) long. From a widely renowned and published collection that has been exhibited at the Metropolitan Museum and Japan Society. Japanese Antique Bronze Rabbit Sculpture in a natural form. It has a rich dark patina, and a wonderful alert presence. 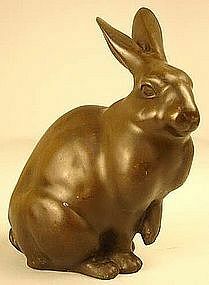 A classic Japanese image of a Rabbit, and a charming Meiji Period Bronze. circa 1890 - 1900. 6 inches, 15 cm height. Taisho Period Japanese Bronze Tear Drop Vase with original box. A classic shape with a gorgeous caramel patina. 8 inches (20.5cm) tall. From a widely renowned and published collection that has been exhibited at the Metropolitan Museum and Japan Society.